The Great Depression (1929-1943) stands as an event unique in American history due to both its length and severity. Stunned by the unprecedented economic collapse of the United States’ economy, a confused and hungry nation faced a time of high unemployment and tremendous suffering. Compounding the hardships of these economic times was the plight brought on by drought conditions of the 1930s Dust Bowl, which caused farmers of the Great Plains, extending into West Texas, to abandon their farms and migrate to California or other cities in search of work – which was mostly nonexistent due to the effects of the Great Depression. With the inauguration of Franklin Delano Roosevelt in March 1933, the nation anxiously turned to the government for assistance. The federal government’s response to this economic crisis was swift and massive with an explosion of legislation called the New Deal, designed to bring relief, recovery, and reform for all Americans. The Works Progress Administration (renamed in 1939 as the Works Projects Administration; WPA) was the largest and most ambitious of the over 100 agencies created under the New Deal. The WPA employed millions of people – mostly unskilled men – to carry out a variety of public works projects, providing relief to the unemployed. 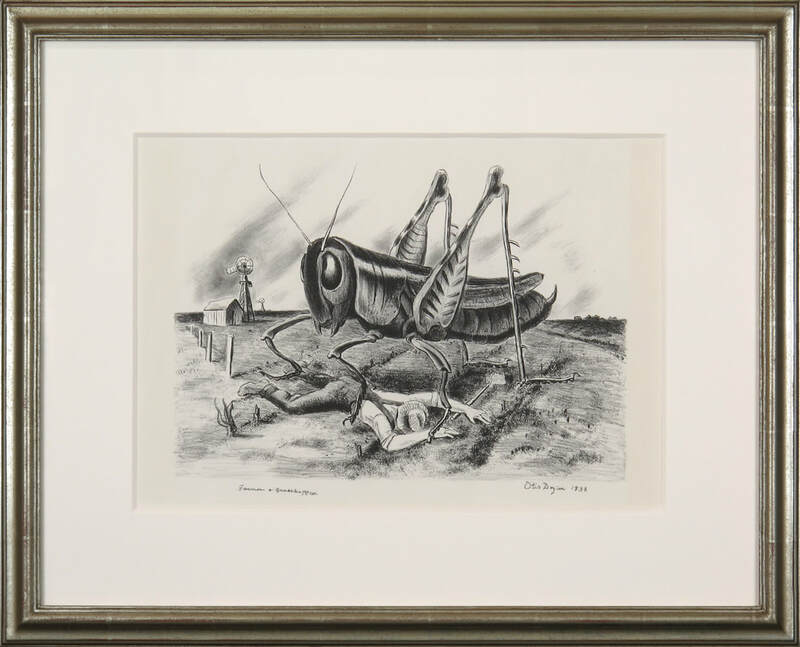 The Federal Art Project, a division of the WPA, was designed to provide employment for artists and, more importantly, fund patriotic art projects in an effort to rally dispirited American citizens. George Biddle, a classmate of President Roosevelt at Groton School, is credited with first suggesting a federal art program to FDR. Biddle studied painting with famed Mexican muralist Diego Rivera and was inspired by the socially-conscious, Mexican mural movement of the 1920s. He wrote to Roosevelt suggesting the formation of the project, which was swiftly approved. The Federal Art Project of the WPA hired hundreds of artists who collectively created more than 100,000 paintings and murals and over 18,000 sculptures. Many of these artists employed by the Federal Art Project lived and worked in the Lone Star State, creating paintings, murals, and prints. Dignity in Labor: Texas Regionalism from the Bobbie and John L. Nau Collection captures this pivotal moment in our nation’s history, focusing on the artistic achievements of these Texas artists and Texas’ cultural history. 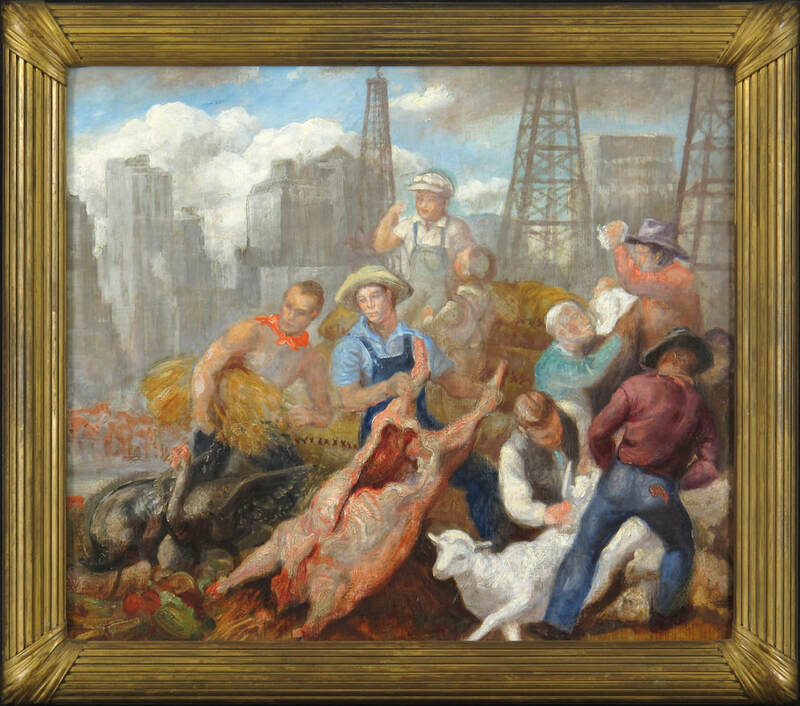 Prevalent during the 1930s, Texas Regionalism was an American realist modern art movement wherein artists depicted rural life and landscape scenery of the Lone Star State. This group of artists captured the pure essence of Texas – its landscapes and people – at a defining moment as Texans suffered through the Dust Bowl and the Great Depression. 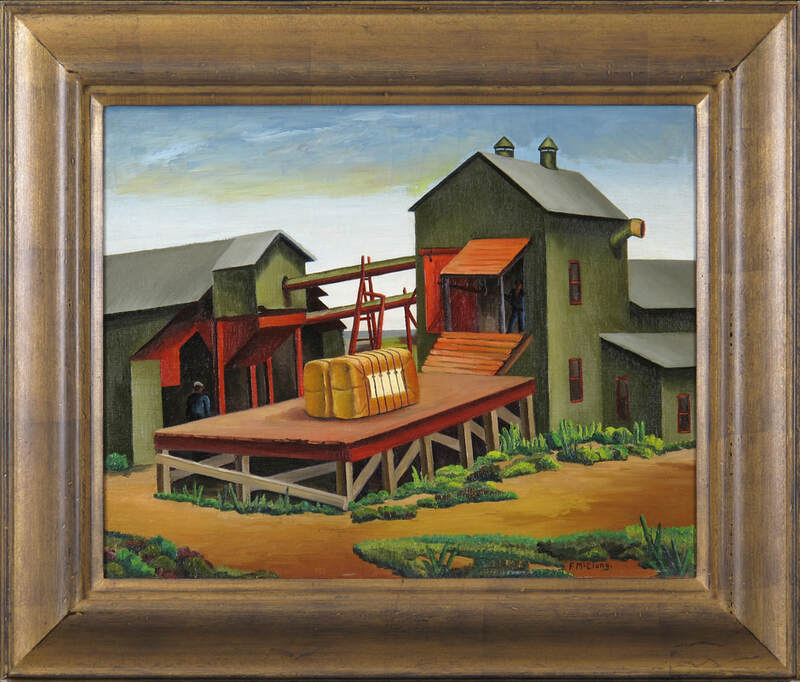 Artists such as Jerry Bywaters, Alexandre Hogue, and Merritt Mauzey sought to illustrate the interaction of people and the land – portraying the hardworking character of Texans, the development of the oil industry, and the panorama of the vast open space of the state. Through these remarkable paintings, lithographs, and murals of ordinary people and places in everyday circumstances, these artists of the Texas Regionalism movement sought to reveal the unique character of Texas and Texans. 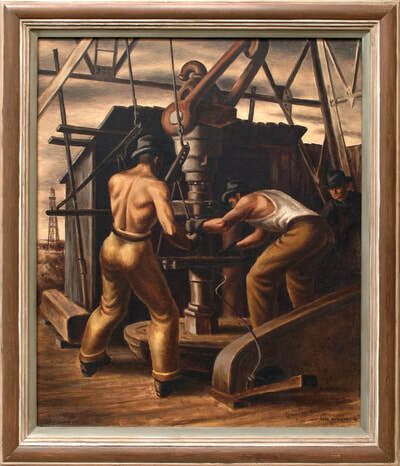 Oilfield Workers, 1940, Oil on canvas, 36.5 x 30 in.